ONERUN is a non-profit organization based in London Ontario to help support cancer programs throughout London and area regions. What began as the inspiring story of Theresa Carriere and her battle with breast cancer, has evolved into an opportunity for youth and the London community to honor those who have passed and support those who are living with cancer. Since 2010, the fundraiser has raised over $900,000 to support programs that continuously fight against cancer. If you’ve been to any London Knight’s game, you’ve probably encountered Finchy or have at least seen photos. 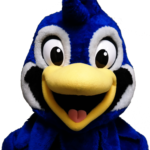 Finchy is the Vice President of Fun here at Finch Auto Group and can be recognized in the big blue Finch costume from kilometers away. He is known for his constant waving and dancing around the Budweiser Gardens, ensuring everyone is having a fantastic time. But who is Finchy? Under the mascot lies a humble young man who is striving to succeed in his soon to be political science career. The master behind all the smiles and sometimes even tears from the little people who think he’s scary – Stephen Robinson. Stephen attends Sir Wilfred Laurier Secondary School in London Ontario and is trying to make a difference in his community just like thousands of other students are doing-so along this campaign.